Dr. Matthews graduated from high school in Oregon and did his undergraduate studies at Virginia Tech where he received a B.S. in Human Nutrition Foods and Exercise. 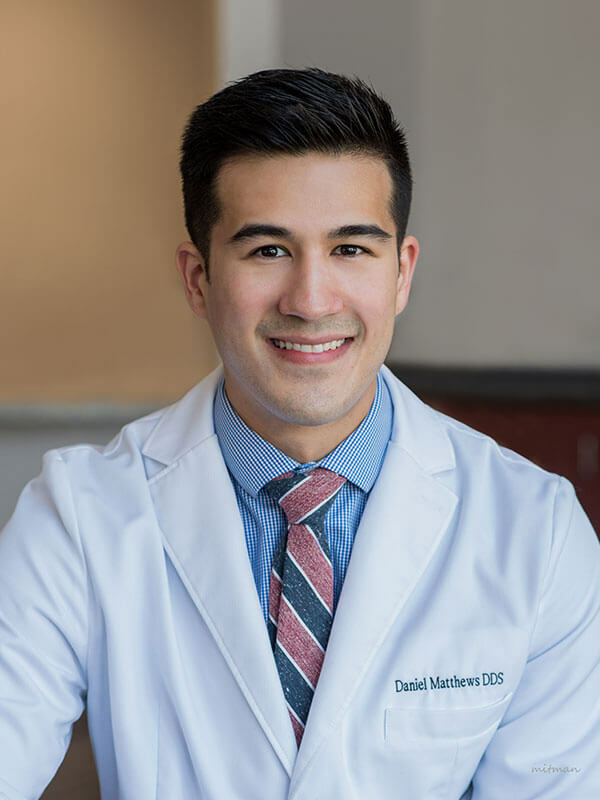 Dr. Matthews received his Doctorate of Dental Surgery from the University of Maryland Baltimore which happens to be the oldest dental school in the world! Dr. Matthews is a gentle dentist with a love for his profession. Real patient quote: “I don’t know how you do it but every time I never feel that damn needle!” – B. Miller, Jr.
Dr. Matthews is constantly learning as much as he can to expand his skills. He spends a lot of time studying from world renowned dentists who are at the cutting edge of the profession. Dr. Matthews has focused his training towards cosmetic and implant dentistry. This included a 300-hour implant fellowship program organized by NYU and DentalXP. Dr. Matthews holds memberships with the American Dental Association, the Pennsylvania Dental Association, the American Academy of Cosmetic Dentistry, the International Congress of Oral Implantologists and the American Academy of Implant Dentistry. As someone who was afraid of the dentist as a child, Dr. Matthews knows what it’s like to be the patient so he strives to make the experience as easy as possible. He is very dedicated to making everyone feel like family. When Dr. Matthews is not practicing dental he loves traveling, skiing and spending time with his wife and cats. They are expecting their first child this year. Fabey dental patients have been raving about Dr. Matthews. His patients have called him a life saver, miracle worker, magician, wizard, and hero! Once you see Dr. Matthews you may never look at going to the dentist the same way again!